AirBnb is a company close to my heart. While studying abroad in Berlin, I took the opportunity to travel as much as possible and used AirBnb to find accommodation in various European cities. My experience with the product was very positive and by the end of the semester I had come to enjoy and trust the product. 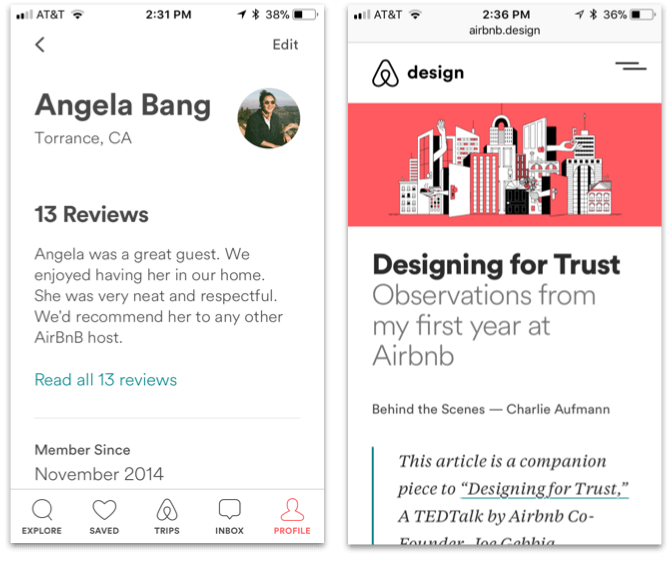 AirBnb’s Design for Trust concept has been fascinating to read about— how good design has overcome stranger danger bias and resulted in a multi-billion dollar business built on people sharing their personal space. Not only is there a sense of trust between the user and the product, but between the users themselves. AirBnb boasts that it has “millions of places in over 191 countries” that you can choose from, which can end up being a lot to search through. The number of listings in any given city are overwhelming, and more often than not I would end up making a booking for the sake of time. Personally, I like being confident in my decisions while making sure I’m getting the best deal, so in instances like these the end satisfaction wasn’t quite there. How can we make AirBnb customers feel more confident in their booking decisions? I reached out to others to hear about their motivations around using and expectations of AirBnb. Goals that users have are saving money, getting the best deal, and having access to information that will help them make the right booking. A way to compare AirBnb’s listings through the display of relevant information (leveraged from Airbnb’s sizable data set), a sort of pros and cons list that will ultimately to users feeling confident and more satisfied in their booking decisions. I mapped out how an AirBnb user would currently get to a listing and save it to a List, which is what I envision the Compare feature to parallel. 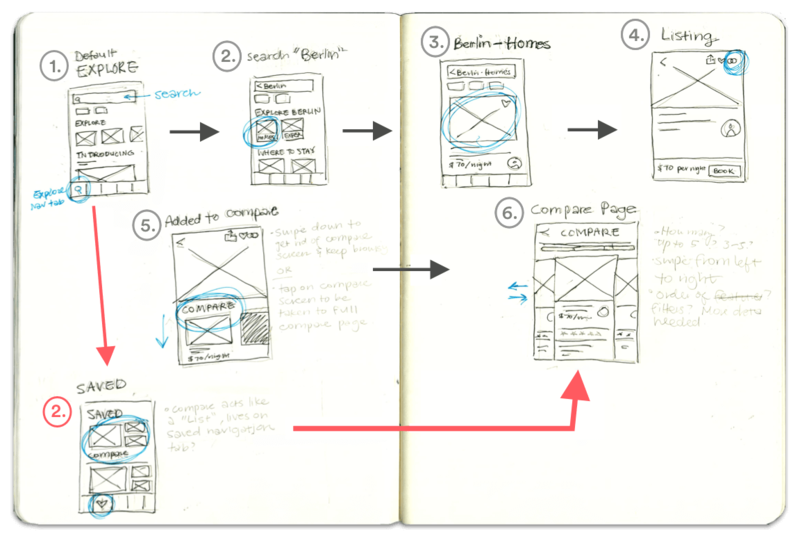 * Steps 1-4 is the path from AirBnb’s home page to a listing in Berlin. Steps 5 and 6 are how that listing would be added to and seen in the context of the Compare feature. * The pathway in red is where the Compare feature would live as a Saved List. Using AirBnb’s existing UI as a base, I created mockups in Sketch. * From the listing page, the user taps on the icon in the right-hand corner add this listing to the Compare List. * They then can tap into the Compare page to view the listings they want to compare. * Includes relevant data-driven insights as well as a general idea of the listing’s pros and cons. * Inspiration for the latter came from Amazon’s retail website, where a Most Helpful and Critical Review are displayed side by side. * This is how a user would access the Compare feature directly from Home page. * I imagine it similar to a List, so it lives with the other Lists under the Saved main navigation tab. Next steps would include usability testing to validate the feature’s success, to see if users feel higher rates of confidence and satisfaction in their booking decisions. In addition, there is much room for research in determining which information is displayed and in what order to users— which leads into the topic of personalization. If personalization is possible, then the insights and the pros and cons can be greatly enhanced to be more specific to each user. Usability tests: do users feel more confident in their booking decisions? Research: what information is most important to users?